Oscar's Grind Roulette Strategy was designed in 1965. The creator supposed to be a gambler named Oscar, but we don't know it for sure. Anyway, this is a simple strategy proved with numerous computer simulations. It wasn't designed to be a moneymaker, just to make you one unit winning per session. So, you have to calculate your resources and decide how much money you can bet. Then you have to pick one of even-money bets, for example odd, or maybe black, and stick to it. When you reach the amount of 1$, it's the end of this session, and you have to start a new one. Like we explained previously, your goal is to make a profit of one unit per session, in this case one dollar. 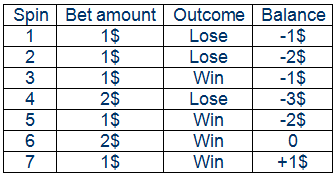 In this case, the cycle is over after only three bets, cause you have reached the amount of 5 $, which was your goal. Now you can start a new session. Can you earn some serious money? This system is designed to get you one unit of winning for each session. So, if you are loosing, you bet one unit in the next spin, if you are winning, you have to increase the bet for another unit, but in case if the winning in the next round would be higher then one unit in balance, you should bet lower. You can see the example for that in second table. The whole system is very easy to understand, and has some logic in it. Maybe you won't win very large amounts of money, but you will be able to take control over your losses. And your winning cycles would be long, but steady. 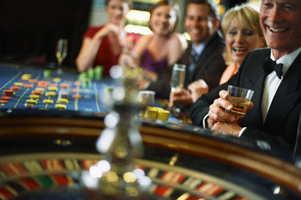 There are numerous other strategies for online roulette playing. If you are interested, you should try free versions in some online casino, before you actually start playing for real money.